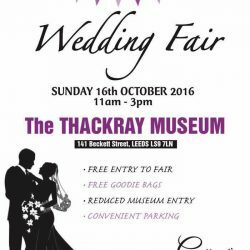 Thompson Towers Wedding Party and Event Hire will be supporting our Industry Partners, Gothard Events at The Thackery Museum Wedding Fair, by doing a leaflet drop in all the brides ‘goody bags’ so get yourself there. Sorry we cannot have a stall this time as we are fully booked out at pre-booked events. Whether it’s searching for the finishing touches or the start of your journey, be sure to find inspiration and amazing offers at this unique wedding event within The Thackray Museum. There will be plenty of local suppliers on hand to help make your big day even more special – just the way you imagined it. PLUS this event will be staged to show you what’s on offer and how to do it on your perfect day. Why not pop down, have a browse around even take in what the museum has to offer – it’s a popular Leeds attraction and with easy parking, free entry to the wedding fair and reduced family admission to the museum itself – make it a day out!